Shami Chakrabarti CBE took on the top job at Liberty the day after 9/11. With it, she became the country’s most prominent spokesperson against what she saw as the erosion of civil liberties. She campaigned against “excessive” anti-terror legislation that followed 9/11 and has criticised the Conservative Party for not conducting their own enquiry into Islamaphobia following alllegations about Islamophobia in the London 2016 mayoral election against Sadiq Khan. Shami first trained as a barrister before becoming a lawyer for the Home Office in 1996. After five years she became the in-house counsel for Liberty. Shami stepped down from being Liberty director after leading the organisation for 12 years. Shami is a Governor of the Ditchley Foundation for the promotion of international relations, and received a CBE in 2007. She was one of six Assessors who assisted with the Leveson Enquiry. Jeremy Corbyn announced her as the only Labour appointment to the House of Lords in 2016 and on 6th September 2016, she was created a life peer as Baroness Chakrabarti, of Kennington in the London Borough of Lambeth. Shami was appointed in October 2016 to the Shadow Cabinet of Jeremy Corbyn as Shadow Attorney General for England and Wales. Shami is a frequent contributor to BBC Radio 4 and various newspapers on the topic of human rights and civil liberties. Shami was assessed as one of the 100 most powerful women in the United Kingdom in 2013 by Woman’s Hour on BBC Radio 4, and in 2014 she was included in The Sunday Times “100 Makers of the 21st Century” list. 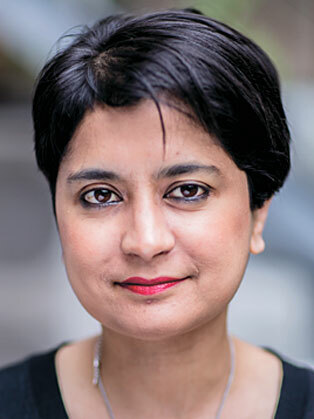 On Liberty – In On Liberty, Shami Chakrabarti - who joined Liberty, the UK's leading civil rights organisation, on 10 September 2001 - explores why our fundamental rights and freedoms are indispensable. She shows, too, the unprecedented pressures those rights are under today. Drawing on her own work in high-profile campaigns, from privacy laws to anti-terror legislation, Chakrabarti shows the threats to our democratic institutions and why our rights are paramount in upholding democracy.